Luiz Felipe Scolari is, for now at least, the manager of the Brazilian national team. A former player himself (and by all accounts, Felipão was a bad one), he is perhaps better known for his managerial career. Luiz first started managing in Kuwait (HOME COUNTRY SHOUT OUT), winning the Emir’s Cup with local club Al Qadsiya then managing the national team to a Gulf Cup victory in 1989. In 1993, Scolari returned to Brazil to manage Gremio, leading them to six titles in three years. Still, he was criticized by the media for playing a pragmatic, workmanlike style of football, You know, the kind he still played with Brazil. Big Phil also had stints in the J. League, before coming back to Brazil again to manage Palmeiras. 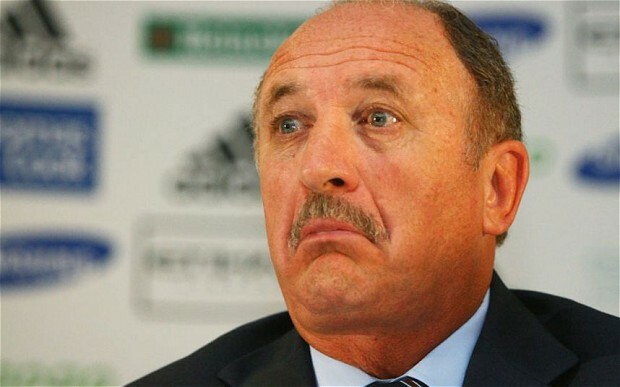 Scolari led Palmeiras to the Copa do Brasil, the Mercosur Cup, and their first Copa Libertadores title with a win on penalties over Deportivo Cali ofColombia. They were also runners-up to Manchester United in the 1999 Intercontinental Cup. He was named South American Coach of the Year for 1999. Things were looking up. Scolari was then tasked with helping Brazil qualify to the 2002 World Cup. He refused to include local legend Romario in his team, relying instead on Ronaldo, Rivaldo, and a young talent by the name of Ronaldinho. The Selecao went on to win the World Cup, so score one for Philly. And this is where this story begins. Well, yesterday, that’s what happened. But this was a long time coming. Brazil is not short on talent. The list of notable omissions from this national team is talented enough to make it on any other country’s squad. (In fact, ONE did.) Of course, that’s not of any concern to Luiz Scolari. No sir. Scolari is the ultimate believer in loyalty. He’d rather pick players that would die for him and do anything he asks than take a bunch of talented, world class players who can actually score goals and / or defend. The omissions of Atletico Madrid defenders Miranda and Felipe Luis might baffle you and I, but in Scolari’s world, it makes perfect sense. Miranda and Felipe Luis are not his guys, not his mercenaries. In that sense, Scolari is a lot like Jose Mourinho (that they both managed Chelsea at some point in their careers is no coincidence.). And a lot like Mourinho’s Chelsea, Scolari’s Brazil is a pragmatic, workmanlike team that relies on getting it’s offense from one attacker. Mourinho has Eden Hazard, Scolari has Neymar. So, yesterday, bereft of his talisman, Scolari had to manage; he had to come up with a plan, and, like the novice tactician that he is, he decided to attack. Against Germany. He decided to take the game to a German team that would thrive in open space. Instead of closing up shop and relying on counter attacks and set pieces, which he has done all tournament, he decided to take the game to the opponent, to play joga bonito with a team that is short on the bonito. Needless to say, it was feo. The 7-1 result would put the death knell in this era of Brazilian football. Many of these players have probably played their last games in the NT, and Scolari is sure to either resign or be fired. That’s a start. That’s not the cure for this sickness of Brazilian football, however. For Brazilians to succeed, for Brazilians to once again become the envy of footballing nations worldwide, they must get rid of their win at all costs mentality. They must cleanse themselves of people like Scolari and his mercenaries. Above all, they must remember joga bonito*. * They should also pick players who can play Joga Bonito. This entry was posted in 2014 FIFA World Cup, FIFA World Cup. Bookmark the permalink.